The sign describing the tumulus on Shrewsbury Lane is, I think, disappointingly lacking in detail. When was the barrow built? The sign identifies it as “Bronze Age, approximately 2600-700 BC” – a range of 1900 years, how approximate can you get? It also mentions that the mound has been opened “at some stage” but that “if anything had been found in side it is not recorded”. There must be more information somewhere, I thought…. A web search quickly found the Wessex Archaeology report on Shooters Hill. This mentions the barrow and said that it “suggests that there may have been a Bronze Age occupation or ritual centre in the area of Eaglesfield Park”, but focusses more on the second world war archaeology that fed into Digging Dad’s Army and the Time Team programme Blitzkreig on Shooters Hill. The barrow is mentioned on various websites, such as the Megalithic Portal, the Modern Antiquarian and Archeology Data Service, but with no additional information. Unexpectedly a document submitted as part of the planning application for the Equestrian Centre included a Cultural Heritage Gazeteer which listed a possible 6 barrows in a barrow cemetery, with only one still remaining, but no more details. No. 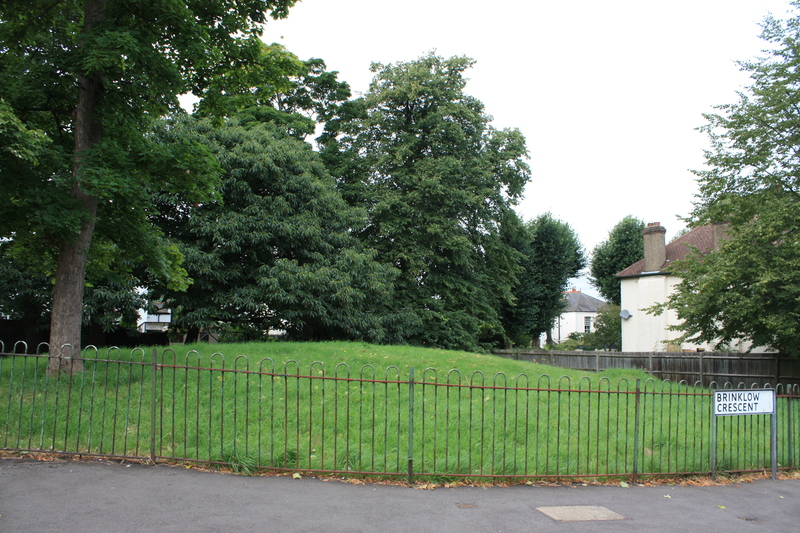 1 Mound, about 75ft in diameter, formerly in Tower House garden, now in the angle between Plum Lane and Mayplace Lane. Opened recently; contents unknown. No. 2 Mound, about 36ft in diameter on a site formerly in the grounds of Shrewsbury House, now on the west side of Ashridge Crescent. Destroyed 1934-35. No. 3 Mound, about 60ft in diameter on a site on the north side of Ashridge Cresent. Destroyed 1934-35. No. 4. A similar mound on the same side of Ashridge Crescent. Destroyed 1934-35. No. 5. 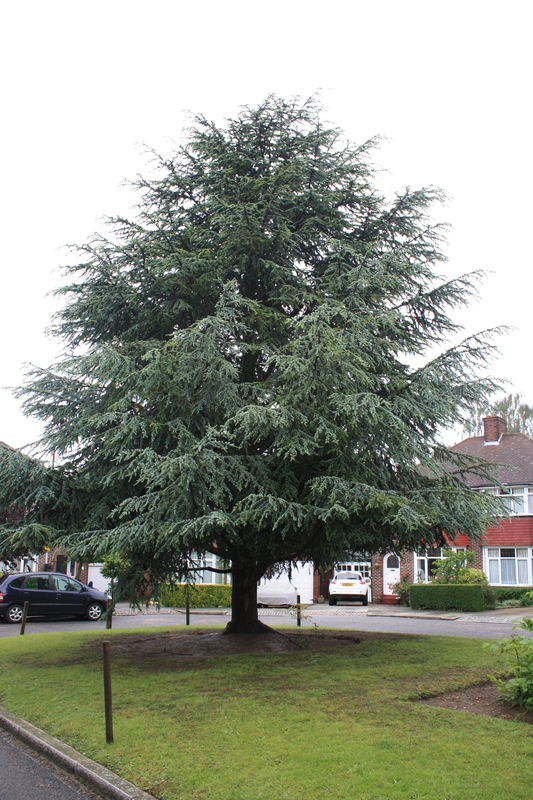 A very low mound was on a line between two conspicuous trees – a cedar and a Spanish chestnut – which have been allowed to remain in Ashridge Crescent. Destroyed 1934-35. No. 6. Shrewsbury Park L.C.C. Recreation Ground. Under the trees a few yards west of the drinking fountain is a symmetrical mound 45ft – 50ft in diameter and about 2ft high. It has not been opened. No. 7. Plumstead Common. 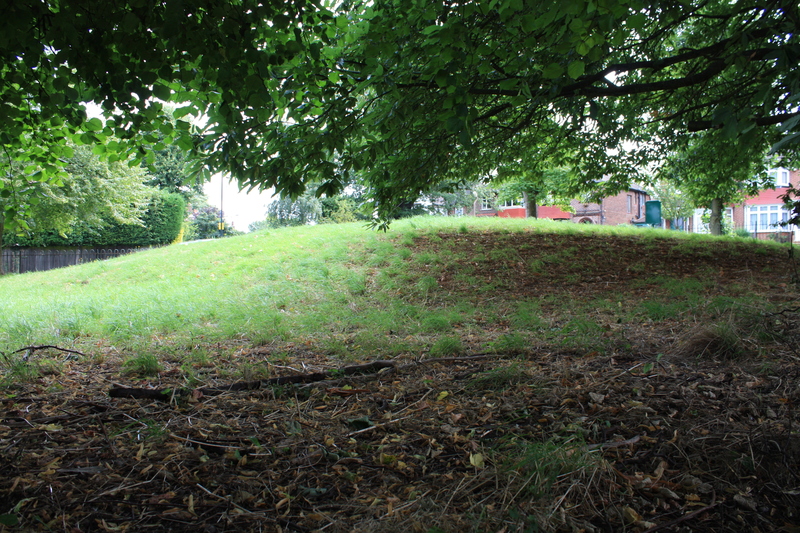 On the eastern part (Winn’s Common) is a mound about 60ft in diameter and much worn down. It has obviously been opened, but when and by whom cannot be ascertained, nor is anything known about the fate of any relics this tumulus may have contained. It is a most regretable fact that six mounds which, perhaps, all contained interesting remains of the people who lived long ago in this district have all been destroyed or plundered and their contents hopelessly lost. The single barrow which has not been opened (No. 6) is fortunately safe from unauthorised relic-hunters. Some day perhaps and with the consent of the London County Council a proper examination of this site may be made. I think the Colonel’s “most regretable” is a considerable understatement – what a shame that there was no archaeological examination before the barrows were destroyed. Where are the remains of the barrows? 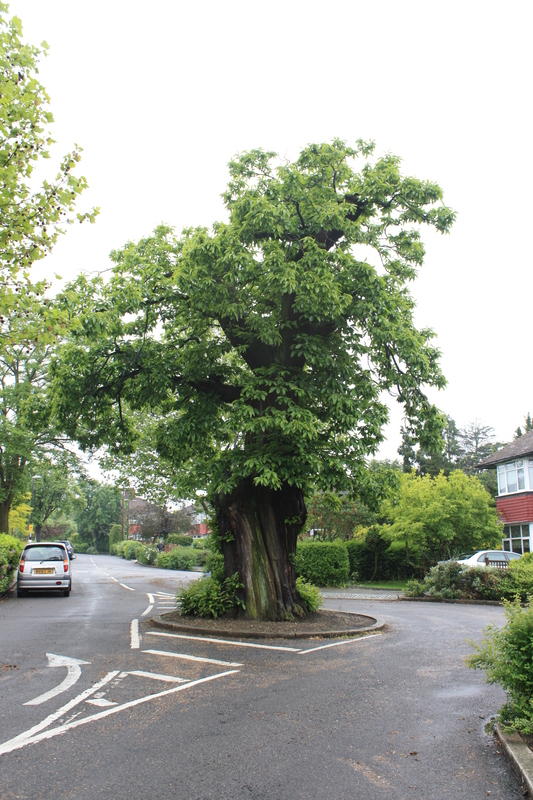 Well there is still an old Chestnut tree in Ashridge Crescent, old enough I’d say to have been around in Bagnold’s day so it could be the one used to locate barrow number 5, but the only possible Cedar looks far too small to be the one he recorded. Barrows number 2 to 5, though, are likely to be underneath the houses and gardens in the crescent. Only slightly deterred I headed for the Heritage Centre, where the helpful librarian found me a wonderful box of Shooters Hill Ephemera, containing lots of fascinating old historical documents, such as those relating to the sale of land on which the houses around Herbert Road were built to the British Land Company, and others about the purchase of the land for Eaglesfield Park at a cost of £4541 3s 4d. In this box I found a computer print-out of an article by Andrew Bullivant and Susan Parker – it looked like a fuller version of their article From Tower House to Brinklow Crescent in Aspects of Shooters Hill Number 2. They described their correspondence with former Labour cabinet minister Douglas Jay, later Baron Jay, who lived at Tower House as a child and remembered playing on the tumulus in their garden. They also mentioned a 1936 booklet by a local geologist, Arthur L. Leach, entitled The Ground Beneath Us, which described the Shooters Hill tumuli. Sounds like it could be useful, I thought, but although the Heritage Center had two boxes of papers by Arthur L. Leach including several about the geology of Shooters Hill, they didn’t have the one about the barrows. Where could I get a copy of Leach’s booklet? I headed to the British Library, repository of everything published in Britain I believed. It was a good reason to get a reader’s ticket too, something I’d always wanted to do. Formalities completed, including two proofs of identity, I searched their catalogue. No sign of The Ground Beneath Us, but there were many other shiny treasures to grab my attention. As well as books on Bronze Age Barrows in Britain, I found in the map department on the top floor a beautiful, heavy volume of Victorian sales literature for great houses, including Shrewsbury House and Mayfield – Lord Penzance’s mansion which was later renamed Jackwood House. The two houses and their surrounding estates were described in great detail, right down to the number of servants’ closets, and illustrated by pastel coloured lithographs. Next time I go to the British Library I’ll take a pencil (pens strictly not permitted) to make some notes for a future post about these great houses. My final stop on the quest for information about the Shrewsbury Tumulus was at the Museum of London to check if any artefacts from the barrow had been deposited there – but though there were many elegant bronze articles from across London, nothing from near here. So my quest to know more about the Shrewsbury Tumulus has failed, for now. However I did learn something about the Beaker Culture in Britain which coincided with the start of the Bronze Age in around 2500 BC. The use of round barrows for funerals was one of the characteristics of the Beaker Folk, often found clustered in family groups. Ritual seems to have been important to them; many of the beautiful bronze swords and spearheads from this time in the Museum of London were found in the River Thames where they had been deposited as part of some kind of ceremony, and they were responsible for one of the major phases in the development of Stonehenge. They seem to have had a strong distinction between the land that they farmed – the land of the living, and the land of the ancestors where their burials took place, so perhaps the summit of Shooters Hill was a sacred place for them. And as a bonus I found some new and interesting documents about Shooters Hill! As always, very interesting reading, where do you get the time?